You'll find everything you need here, just like home. 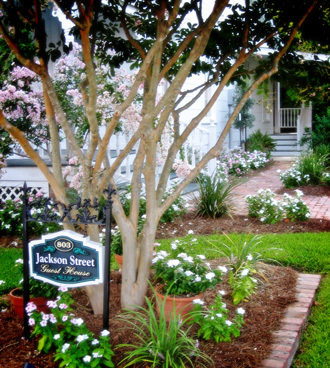 From high speed internet to a quiet place to sit and read, the Jackson Street Guest House offers its visitors the comforts of home...and more. 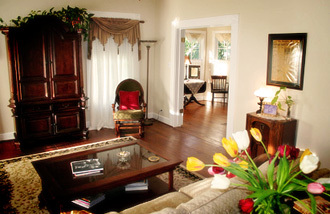 The Jackson Street Guest House is loaded with comforts that the discerning traveler will enjoy. Creative and tasteful touches of elegance, along with complete privacy and the comforts of a cozy, yet spacious home will make your stay an enjoyable one. 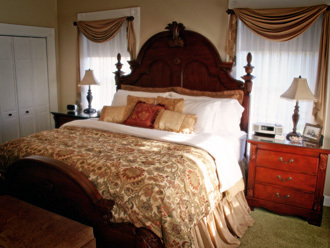 The king suite features a king size bed, two televisions, whirlpool tub, and beautiful marble shower that offers travelers a respite from a hard day on the road. The separate living room provides opportunities for entertainment with a DVD player, along with free high speed wireless internet. 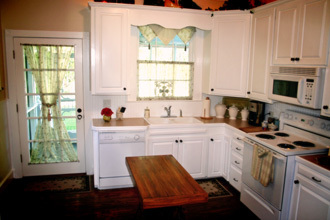 In the full kitchen, guests will find complementary snacks and drinks for relaxing around the dining room table. And, the back porch is perfect for unwinding in the evening or for enjoying that first cup of coffee at daybreak. 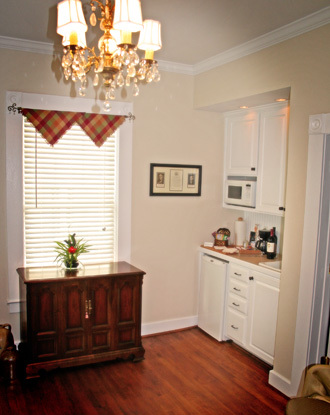 The Jackson Street Guest House is just like being at home . . . only better. This three-room suite is available if more space is needed. It has its own separate air and heat, along with its own private entrance, or can be accessed through the king suite. Included is a queen size bed, full bath with tub/shower, two televisions with cable, kitchenette with microwave, refrigerator, and coffeemaker, and private entrance. It also has a large covered patio area for outside enjoyment.